Prepare for impact. Chen Wei, showing at Ben Brown Fine Arts, is a technical virtuoso with the camera, an artist in the way he composes his shots. He first works meticulously in draft form on paper and prepares his photographic canvas, the lighting. The result, to reverse the saw about a picture being worth 1000 words, is that he seems to be able to build 1000 narratives into a single photographic still life. Hours after I saw his show I was still working out the complexity – and the gentle, philosophical finger-pointing – of Anonymous Station – Suppressed Scenery and its partnering work Anonymous Station – Scratch Under the Shadow. These consist of life-size studio-built panoramas of a crowded then an empty edge-of-town bus station where the people wait but the buses never come. The image has never left me and I don't think it ever will. This image thus fulfills one of the requirements of fine art: each time you go to it you un-, re-, discover more. Furthermore, in showing us how a crowd of Chinese commuters deal with the long wait for transport, the artist shows us ourselves. Britain has had a bus service since 1902 when the first motorized omnibus was introduced to London. We are still 'in the process of' organizing mass transit by bus. Raw documentary seems to dominate our everyday experience of photography, Chen Wei's approach is to pass the onus back to us in terms of how we react. His Broken Tomato (2009) (below) seemingly replicates the scene of an execution. 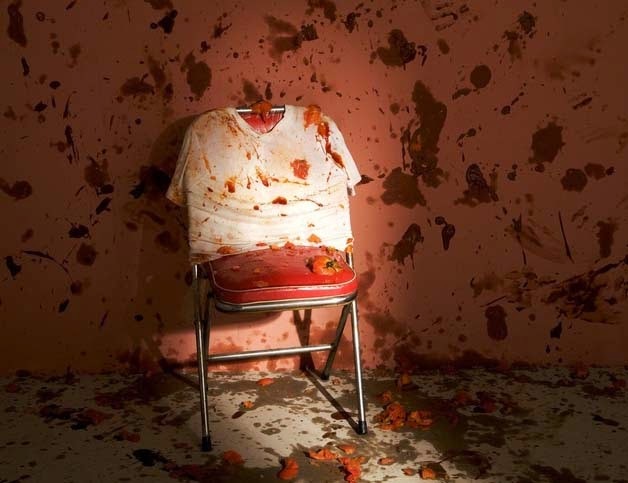 We are confronted with a tomato-splashed tee shirt draped over the back of a chair. The work is thus about the 'idea' of execution rather than death to camera. With Household Telephone (2011), an ordinary rotary dial phone and the only installation in this show, a heavy brass cover has been locked over the dial to disable it. 'They' can phone 'you' but not vice versa. Figured Cloth (2011) depicts a Chinese noodle bar where the diners have gone back to work and the table has been cleared. The single light bulb above each place marks the allotment of space unmistakably – the luxury of elbow space; the leisure to linger over a meal, is absent. In the image, the stains from the meals just consumed remain. The artist then stands back so that the viewer may come forward if they wish and make a more profound analysis. The world Chen photographs is a world where China and its people endure the upheaval of modernization. Looking at Anonymous Station – Scratch Under the Shadow again, may they not lose those inexpressible qualities that make them Chinese. Chen Wei's 'Slumber Song' closes on Thursday 05 June.